I served 4 years (1966-1970) in the Marine Corps. While in the Marines I learned a phrase that has stuck with me. Actually, I think all veterans are familiar with it as the phrase is common in all branches of the military. The phrase is SNAFU. It is an acronym for Situation Normal All F&%#ed Up. This is where our nation is headed under the #BLOTUS. We are heading for a huge and historically ugly SNAFU. And I, for one, don’t want this period to be normal for the United States. I don’t want my country to be characterized by the arrogance, greed, and pathological lying of one man. 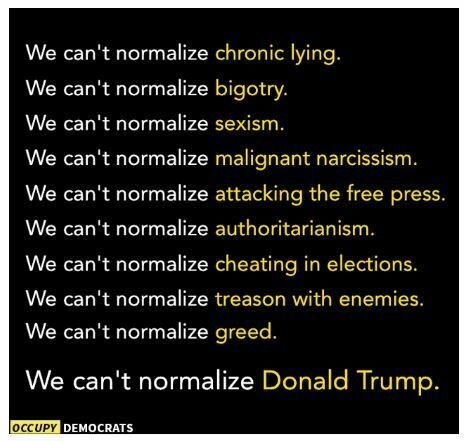 We cannot allow this administration to be normalized. It isn’t who we are. And I hope it isn’t who we want to become. This entry was posted in News & Views, Quotes and tagged authoritarianism, bigotry, BLOTUS, cheating, chronic lying, elections, fear, fraud, free press, greed, hatred, history, laughingstock, Marine Corps, narcissism, normal, President, sexism, treason, Trump, vengence on April 11, 2017 by Ray Buchanan. I am not sure that Thurber’s quote is entirely appropriate for the situation in which we now find ourselves. Looking around with any degree of true awareness, fear and anger will almost certainly be two of the first emotions that come to mind. I once had a bumper sticker that read, “IF YOU ARE NOT OUTRAGED YOU ARE NOT PAYING ATTENTION! Sadly, it has gone the way of all old bumper stickers. How I wish I had that bumper sticker now. Never has it been more relevant. I am paying attention. And I am outraged. I am disgusted with the lies and the slander and all the deceit in the current Presidential campaign. But, I am more outraged that all of us who so loudly proclaim to live by Christian values don’t. I am tired of all of us who play church, but do not live in love, who refuse to be peacemakers, and who really worship at the altars of wealth and power. When I look around in awareness I am saddened to realize that we actually have the government and the leaders we deserve. This entry was posted in News & Views, Quotes and tagged altars, anger, attention, awareness, bitterness, bumper sticker, Christian values, church, elevance, fear, government, hatred, James Thurber, leaders, outrage, power, presidential campaign, quotes, trepidation, vengence, wealth on October 4, 2016 by Ray Buchanan.